This November (2007), The Lucerne Festival presents At The Piano, featuring an international cross section of everyone’s favorite stylists and grand masters: Alfred Berndel, Maurizio Pollini, Leif Ove Andsnes (with the Chamber Orchestra of Europe), Andreas Haefliger and the Labèque sisters. Also on hand are the specialists: András Schiff (Haydn); miniaturist Marino Formenti and the improvisations of Fazil Say. 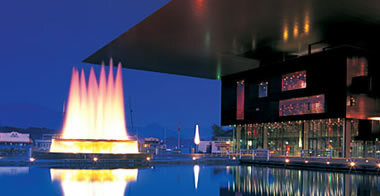 It is a prestigious line-up; nonetheless the major star at the Lucerne Festival, as always, is the concert hall itself. The KKL (Kultur und Kongresszentrum Luzern), a 1,840-seat concert hall designed by Parisian architect Jean Nouvel, in collaboration with the late great acoustic designer Russell Johnson of New York, seemingly floats on Lake Lucerne. Nouvel’s design comprises striking crisp lines, reflective facades: a spiky modern inflection to the city’s old world charm. Arresting as the dramatic interiors of the concert hall are, its not what you see that is important, but what you hear—or how you are hearing it. Herein lies the genius of Russell Johnson, who passed away in August this year. Johnson, the head of Artec Consultants, a theatrical sound design firm, envisioned a hall that created excellent acoustics “for everything from unamplified guitar to early music, a string quartet or an orchestra of 150 with a chorus of 20″. It’s a rare instance that one room can cater to the temperaments of different musical animals. Generally a venue is distinguished by a signature “acoustical palette”. A number of factors contribute to this: size, depth, height and building materials. Clap your hands in the comfort zone of your living room and the sound is easily absorbed by sofa, curtains, carpets; the same handclap in a high-ceilinged cathedral built of stone, wood, glass—sound reflective surfaces— generates lush and complex aural sensations. Using similar reflective surfaces, Johnson devised a 7000 cubic meter reverb chamber for the hall that can be calibrated with the deployment of heavy sound absorbing curtains. The other innovation that lends this room its flexibility is a large two-piece cherrywood canopy, hanging directly over stage. This canopy, which is motorized and computer controlled, can be fine-tuned to the needs of the acoustic and visual scale of the performance. Usually the canopy and the 20 foot high curved reverb doors (52 in number) spread across the balconies on three levels, are at preset positions— however a “tone meister” is on staff to tweak the acoustics to the desired output. From the temple of pure acoustics into the glass tinkle and smoky after-hours of the same festival moved Off Stage. “We created Off Stage to highlight another dimension of the music,” says Michael Haefliger, Director of the Festival. That parallel universe is the world of jazz, blues, ragtime, doo-wop, soul—twentieth century (mostly American) inventions. The venues are a selection of Lucerne’s twelve swankest cocktail lounges and restaurants. In residence will be Switzerland’s own Alessandro d’Episcopo and Ricardo Regidor; Julien Brunetaud of France; Dado Moroni and Rossano Sportiello from Italy; from Germany: Anke Helfrich, Frank Muschalle, and Claus Raible, and from the US: Lisa Otey, Alkis Steriopoulos, and Jon Weber. From the looks of it, while the Off Stage venue acoustics in no way promise to rival the virtuosity of the KKL—they certainly make up for it with ambiance: from the plush warm art deco of the Louis Bar at the Hotel Montana to the minimal cool of the lounge at Hotel Seeburg. And you can have a cocktail too, with snacks.